Poor Facebook seems to be going in the wrong direction with its Home launcher, adding a much-needed Favorites tray while breaking support for two of the hottest Android smartphones around. Android Community reported Thursday that the latest update to Facebook for Android appears to be off to a rocky start, at least for owners of certain high-profile handsets. First the good news: The latest Facebook update released to Google Play adds welcome new features such as changing the audience for existing posts and sending multiple photos in a single message. The social network also added bug fixes for Facebook Home users, along with the ability to "customize your app launcher by dragging the apps you use most to a new favorites tray." 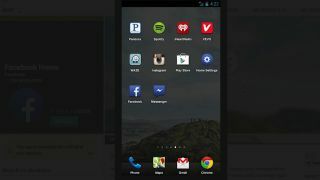 While the Facebook Home launcher itself wasn't actually updated, the official Facebook app introduces the ability to add Android apps to a Favorites tray, complete with a row at the bottom available for one-tap use. Or at least that's the idea - the report claims the update breaks Facebook Home support on the Samsung Galaxy S4 and HTC One, two of the most popular Android smartphones around. Both handsets received official Facebook Home support in May, suggesting the sudden lack of support is a bug which will soon to be rectified by another update, either to Home itself or the official Facebook app. On the brighter side, the Facebook update also introduces new privacy settings for what can be shared with Facebook Home, along with always welcome "stability and memory improvements." Read more about Facebook Home support for popular Android devices!